From Iloilo, we rode a sikad (padyak in Tagalog) going to Muelley Wharf. Fare is PHP 10.00. Jessa and I already had our ticket back to Bacolod (care of Libreng Sakay Pabalik promo of Oceanjet), but it needed to be verified first at the ticket booth. One-way ticket fare costs PHP 300.00. Eto na ata ang pinaka-thrilling na 1 hour ferry ride ko! And my friend, dahil sa hilo di kinaya, ang kinain na picnic, s*nuka din sa lalagyanan ng picnic! That picnic can is a savior! Funny scene: After awhile, I offered her a candy but bago pa sya makapag-oo, nasubo ko na ang candy! Since wala ng candy, hinati ko na lang! Hahaha! At 4:15 PM, we arrived Bacolod. Thank God we arrived safe. Since, our friend has a friend, Tata, who lives here in Bacolod, she offered her Tita’s place for our stay. So from the port, we rode a tricycle going to SM (fare is PHP 10.00 with 5 minutes travel time). And from SM Bacolod, we rode a jeepney going to our friend’s place (Airport Village ?). At 5:30 PM, we arrived at Tata’s place. When we arrived, syempre medyo nahihiya-hiya pa ako! We dropped and fixed our things in our room. After awhile, we had our dinner. Thanks Tata and family for the free accommodation and dinner! For those, who will go to Talisay Ruins by commute. There’s a multicab (with Barangay Bata signboard) along Lacson St. going to Barangay Bata and just ask the driver to drop you at the street going to the ruins. And from there, there are tricycles going to the Talisay Ruins. Ask the tricycle driver for special trip (to fetch you since there were no regular tricycles from the Ruins). 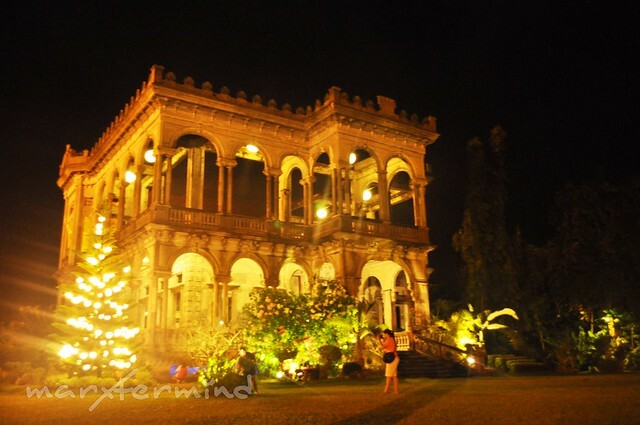 The Ruins of Talisay (old Don Mariano Ledesma Lacson Mansion). 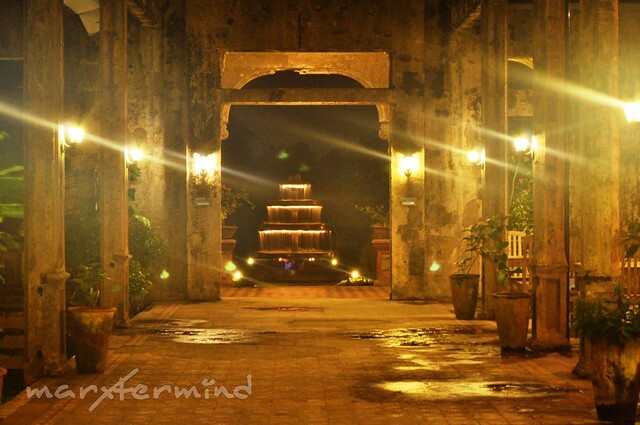 We arrived at the The Ruins of Talisay around 7:40 PM, there’s an entrance fee of PHP 40.00. Mejo basa ang lupa, umulan kasi. And di ko na din naabutan ang dusk, which is a good time to take a picture of the mansion. Balay Daco, Simento nga Balay, Mansyon, Palasyo, Lacson Mansion, and Balay ni Amo. These are just but a few of the names used to refer to the mansion of Don Mariano “Anoy” Ledesma Lacson. However, the one name that best describes the structure is the term which was coined by locals, The Ruins! The structure of the mansion of the sugar baron Don Mariano Ledesma Lacson (1865 – 1948) is of Italianate architecture with neo-Romanesque columns. It is believed that the father of Maria Braga had multi influence in the design and architecture of the mansion. It was after the death of Maria Braga and became the residence of their unmarried children. It was the largest residential structure ever built at that time. The structure met its sad fate in the early part of World War II when the USAFFE (United States Armed Forces in the Far East), then guerilla fighters, burnt the mansion to prevent the Japanese forces from utilizing it as their headquarters. Despite the inferno that it underwent, bringing down the roof and the solid wooden floors, the structure has withstood the ravages of time mainly due to oversized steel bars and the A-grade mixture of concrete used in its construction. Though it was just a short time to explore it, we were amazed and charmed of its beauty. At exactly 8:00 PM, lights were turned off and it’s our time to go back to the city. We asked the driver to drop us at the Lagoon along Lacson St. When we arrived at the Lagoon, there are Chinese New Year lights and decorations along the streets, and even Chinese Animal signs placed around the lagoon. 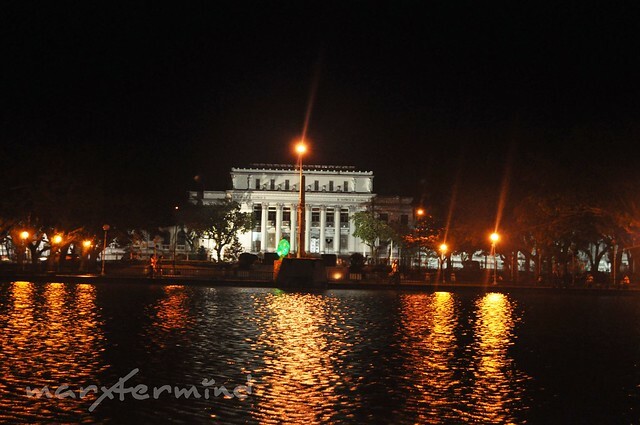 And here’s the Negros Occidental Provincial Capital and the Lagoon. I was surprised that there are live school of fish in the lagoon. Afterwards, we walked going to Cafe Calea. It took us 10 minutes to get there from the Lagoon. Cafe Calea is just along Lacson Street and they are known for their cakes. We tried their delicious cakes. (I’ll have a separate post for this!). Afterwards, we decided to go home since it’s already raining. Bacolod is truly a city of smiles. Good people, charming places, and appetizing food! A great city to go and explore. If I will be ask if I’ll come back to this place, definitely Yes! There are still more to experience! 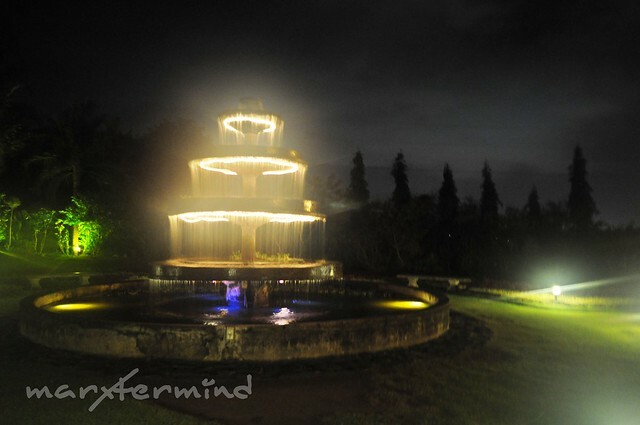 ganda pala ng night shots ng fountain sa Talisay ruins dapat bumalik ako dyan!! @Ian, yup sunset! mejo on and off kasi ung rain when we got there. They said in sunset time, The Ruins has a dramatic effect … I've been dreaming to see this structure there's a classic feel to it. 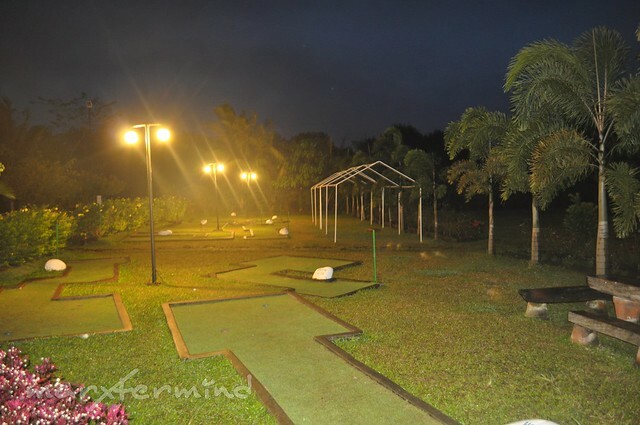 It added new attractions to see in Bacolod. 'Been reading your Laguladon post it is really helpful in planing my trip to these destination. Nice travel post, keep doin' it. @thepinaysolobackpacker, hehehe… thanks! syang mas maganda if it was taken during dusk! @Jefzz, tama! Babalik ulit ako ng Bacolod if may opportunity and time, dami pa kailangan iexperience at itry na foods! Hehehe!